Every guest can sit back and enjoy their time together in this magnificent Villa with features such as; 1,209 square feet of luxurious living space, two bedroom suites, two full bathrooms, and can accommodate up to six guests which is a tremendous retreat for friends and family who are traveling together. Views from the living room are spectacular and unobstructed, as they are from nearly every room in the villa. A fully-equipped gourmet kitchen features stainless-steel appliances and plenty of cookware including a blender to help create a delicious Hawaiian cocktail. The dining area seats six with additional seats for four more at the breakfast bar. 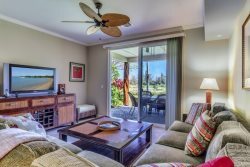 Just off the living room is slider doors to a private covered lanai with a dining table that seats four and beautiful views of the golf course. The master suite features a cozy king-size bed, flat screen TV and an attached bathroom with a separate walk-in shower and a deep soaking bathtub. The guest bedroom features a queen-size bed, flat screen TV and the main bathroom is close in proximity. Extra guests will enjoy the comfort of a queen-size sleeper sofa. Also included is a full-sized washer/dryer, air conditioning and ceiling fans, granite countertops, a built-in microwave, and stainless steel appliances (dishwasher, stove, and huge refrigerator), complementary parking and complimentary WIFI. When you’re ready to head to the beach, grab the beach gear. There are beach chairs, beach towels, boogie boards and a cooler to make it an adventure. Too tired to cook or looking for a night out, there is also dining at the Kings and Queens’ Marketplaces adjacent to the property where you can enjoy fine dining, local fare, and take out/fast food.